After my last date with the Fire and Rescue people on step #13 of the fifteen stairs in our home, it became apparent to me that I was not going to be able to make it upstairs every night to go to sleep. 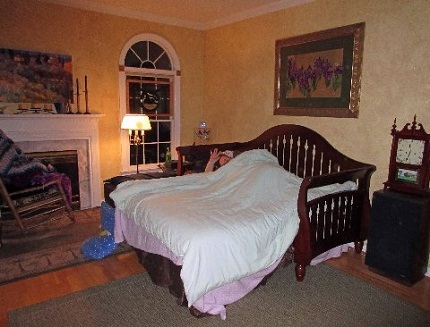 This was a big problem for me because we do not have any bedrooms on the main floor of our house, and I cannot sleep sitting up or reclining on any of our sofas. We survived a couple of nights with my sleeping in a recliner chair, but that was just a temporary solution. 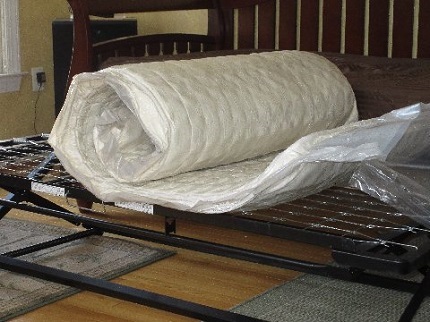 After some anguish on my part, Fluffy and I ordered a daybed from Amazon — something that will masquerade as a sofa by day but that can be turned into a twin bed by night. Actually, it can be used as a king bed because there is a trundle bed underneath it that pulls out and holds a second twin mattress. Ordering the daybed was one thing. Purchasing two mattresses was quite another. Fluffy and I were not excited about buying two mattresses and strapping them to the roof of our car and then driving them home precariously, hoping they would not slide off the back or (horrors!) the front of our car while we were driving down the road. After some consternation, I decided to see about buying the mattresses off Amazon too. Why not? I already buy my books and my vitamins and my potato chips from Amazon. Why not a mattress for a bed? So I checked, and sure enough — there were mattresses for 79 bucks and mattresses people actually liked for $152, with free two-day shipping. That sure beat going to the mattress store and strapping the things to the top of our Buick with bungee cords, so I placed the order. Two days later, two mattresses arrived on the doorstep. 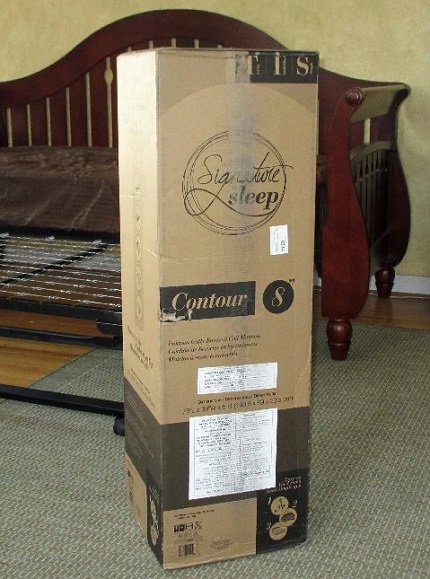 At least, the boxes said they were mattresses. They were not in mattress-shaped boxes. They were in square boxes that were about a foot on each side, and the height of a twin mattress sitting on its side. It was weird. Keep in mind these were not foam mattresses or air mattresses. These were actual mattresses with coils and springs. With great difficulty, Fluffy cut the cardboard end off of a box. The people who put the boxes together knew those boxes needed to stay together. Bad things would happen if those boxes ever came apart during shipping. Each end was reinforced by about three layers of thick cardboard and some heavy-duty glue. Carefully, carefully, he slid the mattress out of the box. It was tightly wrapped with two layers of heavy-duty plastic, designed to keep the air out. We imagined there was a purpose in keeping the air out of the mattress. 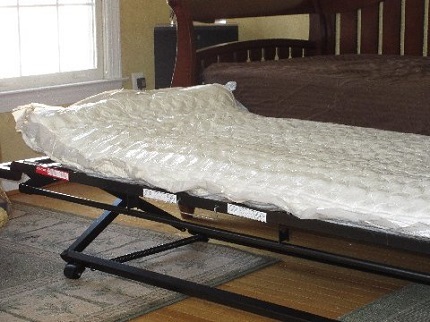 The plastic around the mattress was heavy-duty, to keep out the air. He put the mattress on the spring of the daybed. He took out a knife. He punctured the plastic, and stepped back to pull the plastic off the mattress. It was a good thing he stepped back, because as soon as that mattress got a little bit of air in it, it inflated like a Macy’s Thanksgiving Day Parade balloon. What I want to know is this: Where were the coils? Where were the springs? That mattress may not have been as flat as a pancake, but it was certainly as flat as a good-sized Belgian waffle. How did those springs get so flat? 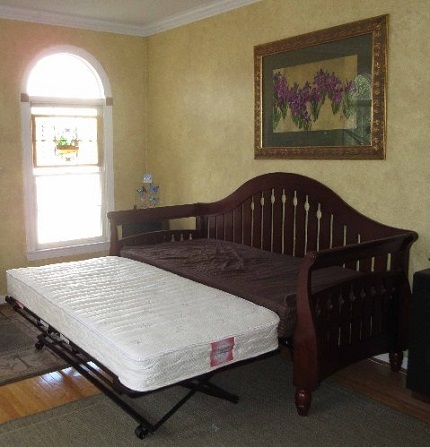 When that mattress was as flat as a Belgian waffle, where were the coils and the springs? All this inflating was done without any lung power on Fluffy’s part. He just had to let the air in and stand back. Within two minutes, the mattress was four inches thick. 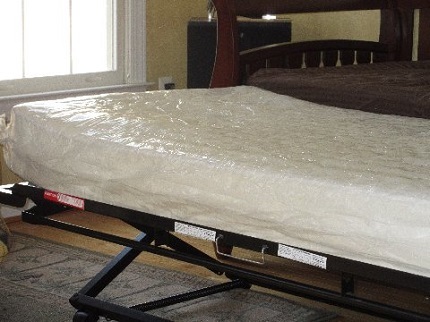 Within three minutes, the mattress was six inches thick. 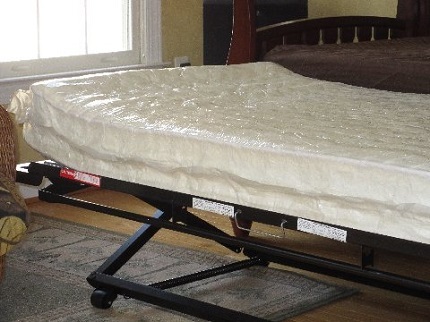 Within about four minutes, the mattress had reached almost its full eight-inch thickness. Voila! 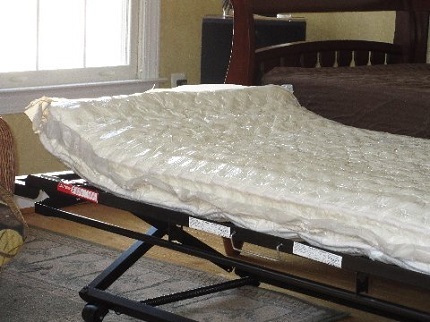 The mattress inflated itself, with the coils and springs falling magically into place. We test drove the mattresses that night and can attest that the mattresses felt just like real mattresses. We never would have guessed they started their lives in a tiny box. Fluffy and I spent the night in our new bed that night and had a delightful night’s sleep. Who would have guessed that something so comfortable could have come in a little square box? But as Fluffy pointed out, good things often come in small packages. The walnuts that litter our sidewalk might have grown into mighty trees if they had landed in fertile ground rather than on a barren sidewalk. Seeds start small, but they are full of great potential. Babies are the same. Having never been a mother, I can’t see the difference in them when they are small. They all look like Winston Churchill to me. But when they get older, they start to blossom. Every one of them is different. They all have different talents, different gifts, and different destinies. They are as distinct as fingerprints. Each one of them is a human seedling, which only needs nurturing to blossom to its full potential. Books, too, can be great treasures. Not all of them are gems, but I’ve learned that like people you can learn something from most of them — even if the thing you learn is that they are best avoided. Children look at this world with awe and amazement. They sit down at the edge of the sidewalk and peer into the grass and the dirt, looking down at the wonders below. I think children have the right idea. Sometimes we get lost in the big picture. We get caught up in paying the bills or doing our jobs or worrying about the important things. But if we step back we can remember the little things that used to bring us so much joy, it gives us more of an appreciation for life. Parents often bemoan the fact that they spend so much on Christmas gifts, but their children are more excited about the cardboard boxes the Christmas gifts came in. Last week, Fluffy and I celebrated the cardboard box. We celebrated the flat mattress that inflated all by itself. 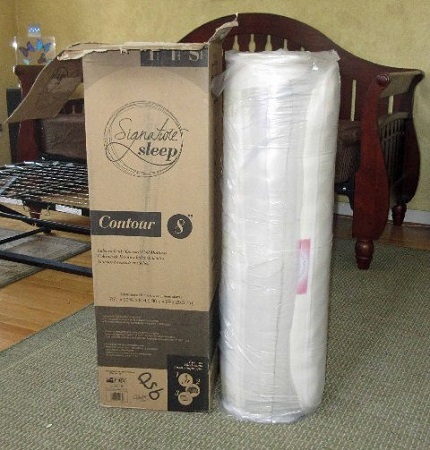 We celebrated the ingenuity that allows a full-sized mattress to be compressed into a tiny box. Especially during this joyous time of the year, we need to observe and appreciate all the miracles in our lives, whether they are brought about by the ingenuity of man or the glorious hand of God.